Last week the government published the annual figures on The Effects of Taxes and Benefits on Household Income, making this a good time to think about how to cut poverty and inequality. In particular, I want to think about the prospects for poverty and inequality if governments aren’t able to increase spending on benefits and services (or not by much). This is a biggish task, so I’m going to spread it over more than one post. Today, I want to concentrate on data we have to use a lot in this exercise. Most of the people I respect who argue that it will be a long time before governments can spend more on benefits and services are also committed to reducing poverty and inequality. For the most part, their answer to the question of how to progress towards social justice relies on ruthless prioritisation and greater efficiency. I want to argue that the figures I concentrate on today and some other evidence I plan to bring in at a later point suggest that this is not enough.The Effects of Taxes and Benefits on Household Income (ETBHI) is not as widely reported as it should be, because it is important for discussions about policy: it shows how taxes and benefits redistribute income between different groups. Final income ­ – add the value of services (‘benefits in kind’). On average, the top decile’s original income is 29.6 times that of the bottom. 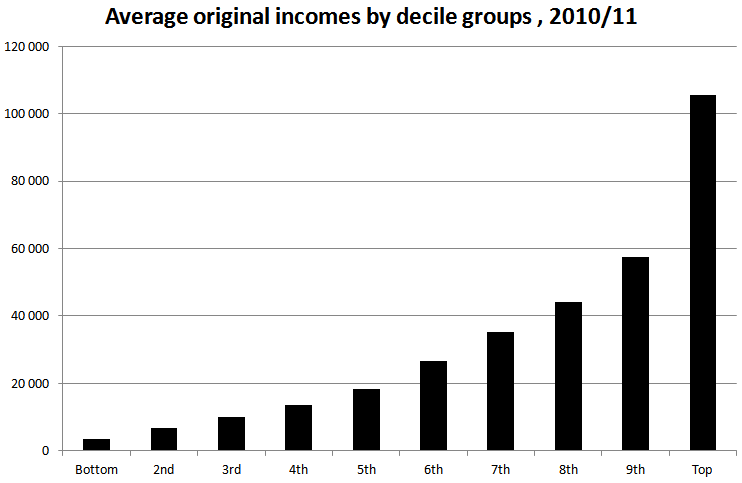 The top decile’s average income as a multiple of the top decile’s has now fallen from 29.6 for original income to 11.2 for gross income. National Insurance Contributions are progressive, except at the very top of the income distribution, where the Upper Earnings Limit reduces higher earners’ tax bills. 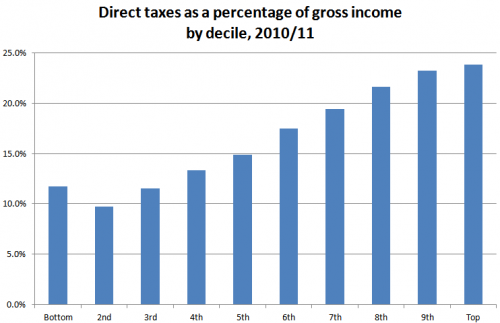 Council Tax is particularly regressive. Income tax is the most important of these taxes, accounting for 64 per cent of an average household’s direct taxes. It is quite strongly progressive; as a result, the average disposable income of the top decile is 9.6 times that of the bottom decile. Because of this, post-tax income is more unequal than disposable income with the top-to-bottom ratio rising to 14.5. 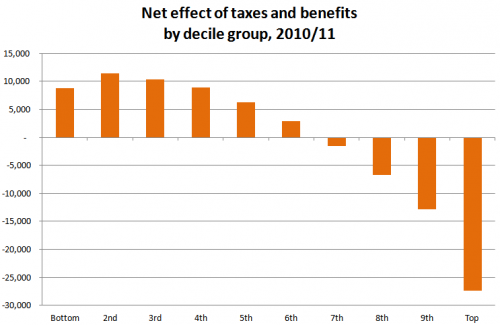 We now come to the effect of benefits in kind. By far the most important are education and the NHS, accounting for 39.0 and 57.3 per cent of spending under this heading. Benefits in kind are mildly progressive: spending on these services for the bottom decile is 31 per cent higher than for the top decile. But this is a massive element of public spending: benefits in kind account for 22 per cent of the average household’s final income. 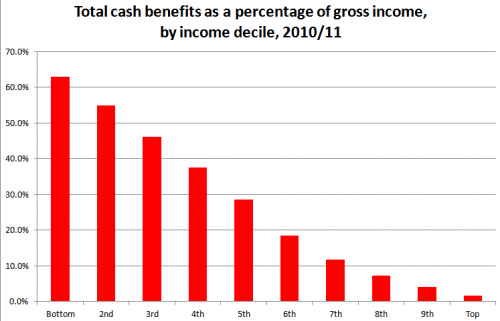 This means that the final income of the top decile is 6.3 times that of the bottom decile. The effect of taxes and benefits is to reduce an original income disparity of 29.6 to 1 to a final income ratio of 6.3. A strategy for reducing inequality and poverty that doesn’t raise taxes and increase benefits and services looks as if it is starting off with a massive disadvantage. This is the issue I want to look at in my next post.